Casa Sol y Mar, now open in Del Mar Highlands Town Center, presents its popular Mexican cuisine, with an emphasis on flavor and freshness. The menu showcases newly created small plates and appetizers, as well as entrées with a contemporary twist. Popular seafood dishes that have been in Powers’ restaurant family for decades, such as Tequila Lime Shrimp, Tequila Lime Salmon, Ceviche and Seafood Chimichanga, still appear on the menu. Additionally, the Ensalada Sol y Mar – an entrée salad replete with shrimp, crab, avocado, Mexican cheese and a fresh assortment of vegetables and greens – makes its menu debut. Ten different flavorful homemade salsas and mole, as well as a number of original housemade dressings and sauces, are also prepared daily with all-natural ingredients. Dining highlights further include a collection of quesadillas, fajitas, tacos, combination plates, burritos, wraps, and notable enchiladas such as the Chicken Mole Enchiladas, Enchiladas Suizas, Enchiladas Rancheras, Enchiladas de la Casa and Enchiladas Huastecas. In the “Especiales” category, guests will be happy to see the Carnitas a la Michoacan. This traditional Mexican dish is prepared each morning and simmered slowly so that the delectable flavors peak by the time it is ordered each day. From the sea, diners can enjoy Seafood Poblanos – two poblano peppers charbroiled and chock-full of sautéed pescado blanco, crab and shrimp, served in a jalapeño cheese sauce and topped with melted cheese. 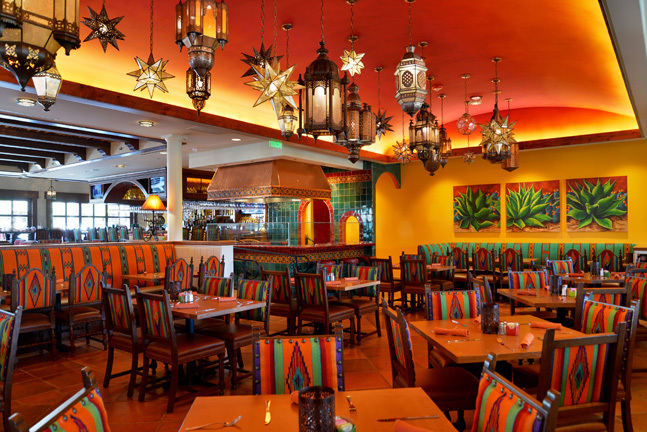 Guests can watch as fresh tortillas are prepared in the charming tortilla kitchen, resulting in a delicious aroma that wafts through the colorful dining rooms that are richly decorated with Mexican folk art. There are also deliciously appealing entrée salads, an extensive children’s menu and gluten-free, vegetarian and healthy dining selections. 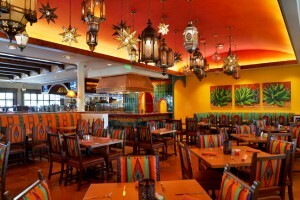 Casa Sol y Mar is located in the bustling Del Mar Highlands Town Center at 12865 El Camino Real. 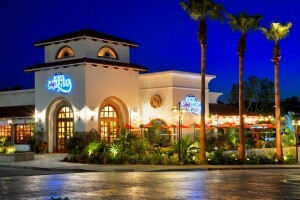 It is the fourth in Powers’ Bazaar del Mundo family of restaurants – Casa Guadalajara in Old Town, Casa de Pico in La Mesa and Casa de Bandini in Carlsbad. For more information, visit http://www.casasolymar.com/. Diane Powers’ Bazaar del Mundo Shops and her family of restaurants are San Diego’s recognized destinations for international cultures and Mexican-spirited cuisine. The Bazaar del Mundo Shops, which have been recognized as one of the best shopping environments in San Diego, create a lively and colorful entry to San Diego’s Old Town community while Powers’ award-winning restaurants – Casa Guadalajara, Casa de Pico and Casa de Bandini – which make up the Bazaar del Mundo Restaurant Group, provide authentic Mexican flavor and ambience throughout San Diego County. The Shops are comprised of colorful boutiques, each offering unique gifts from all over the world, home accessories and collectibles, handcrafted artisan jewelry, plus creative fashion, arts and crafts. Our Kitchen Shop offers vibrant tabletop products and worldwide imported ceramics, as well as specializes in unique and quality crafts and folk art from Mexico. The Bazaar del Mundo Shops and Casa Guadalajara Mexican Restaurant are at the entrance to Old Town on the corner of Taylor and Juan Streets. Casa de Pico is located at 5500 Grossmont Center Drive, La Mesa, 619-463-3267. Casa de Bandini is located at 1901 Calle Barcelona, Carlsbad, 760-634-3443. For more information call 619-296-3161 or visit http://www.bazaardelmundo.com. Diane Powers has opened Casa Sol y Mar, the newest dining destination to join her family of eateries serving fine Mexican food throughout the County. Casa Sol y Mar is located in the bustling Del Mar Highlands Town Center at 12865 El Camino Real, and is elaborately decorated to reflect the true spirit of Mexico. Guests will sense the warmth and romance of Mexico as they enter through the large wood and glass doors and find themselves standing beneath a high glowing ceiling and magnificent iron chandelier. The interior is artfully painted in a fiesta of gold, crimson and orange jewel tones, sparkling from wall to wall. Each room, uniquely designed with its own character and charm, exhibits a slightly different blend of colors, sophisticated lighting, Mexican folk art, festive décor and glazed Mexican accent tiles in red, emerald and orange. The delectable menu features traditional Mexican food with an emphasis on flavor and freshness, including a large selection of regional entrees made from scratch, and award-winning seafood recipes that have been in the restaurant family for decades. In addition, the menu highlights newly created small plates and appetizers, as well as entrees with a contemporary twist. Homemade dressings, salsas and sauces are made fresh daily, along with hot corn and flour tortillas. There is also an extensive children’s menu, deliciously appealing entrée salads and abundant gluten-free, vegetarian and healthy dining selections. The site, formerly a Red Robin, was completely rebuilt to fit the new Mexican restaurant with 200-plus indoor seats and 100-plus capacity outdoor patio. Ninety-seven parking spaces were also added to accommodate the expansion. In the main dining room, guests dine beneath a breathtaking hand-painted vaulted ceiling, dramatically illuminated by 35 traditional brass stars and sparkling glass lanterns, handmade by Mexican artists. On the west side of the room is a series of arches that lead to a smaller dining area with seating for 40 – perfect for parties or banquets. In the lively cantina, guests sip giant frosty margaritas, enjoy fine Mexican beers and an impressive tequila selection while devouring tasty appetizers and entrees. The furniture in the cantina has a “refined rustic” appeal, complemented by reclaimed wood tables framed with black hammered iron. The custom barstools are upholstered with colorful wool fabrics hand-woven by Zapotec artisans in Oaxaca, Mexico. Steps away, guests can watch as fresh tortillas are prepared in the charming tortilla kitchen, resulting in a delicious aroma that wafts through the entire structure. The tortilla area, placed prominently in the center of the restaurant, is enhanced by jade green, orange and red Mexican tiles and a beautiful hand-hammered copper hood. Other Hispanic accents strewn throughout the restaurant include handmade mirrors, copper wall sculptures and glowing iron and rawhide lamps. In keeping with its sister Mexican restaurants – Casa Guadalajara in Old Town, Casa de Bandini in Carlsbad and Casa de Pico in La Mesa – Casa Sol y Mar completes the cultural experience with cheerful mariachi performances Wednesday to Sunday evenings. Diane Powers’ Bazaar del Mundo Shops and her group of restaurants are San Diego’s recognized destinations for international cultures and Mexican-spirited cuisine. The Bazaar del Mundo Shops create a lively and colorful entry to San Diego’s Old Town community while Powers’ award-winning restaurants – Casa Guadalajara, Casa de Pico and Casa de Bandini – which make up the Bazaar del Mundo Restaurant Group, provide authentic Mexican flavor and ambience throughout San Diego County. The Shops are comprised of colorful boutiques, each offering unique gifts from all over the world, home accessories and collectibles, plus fashion, arts and crafts. Owned and operated by Donahue Schriber, the Del Mar Highlands Town Center is North County’s premier shopping destination. In 2009, the center celebrated 20 years in Carmel Valley by undergoing a Re-Imagining that brought seven award-winning restaurants, San Diego’s first luxury boutique movie theater and a modern architectural makeover to the community. Among the new restaurants calling the Del Mar Highlands Town Center home include “Top Chef” alum Brian Malarkey’s Burlap, “Restaurateur of the Year” Scott Harris’ Mia Francesca Del Mar and Davanti Enoteca, Rimel’s Rotisserie, Taverna Blue, The Counter and Urban Plates. For more information about the Del Mar Highlands Town Center, located at the corner of Del Mar Heights Road and El Camino Real, please visit www.delmarhighlandstowncenter.com.